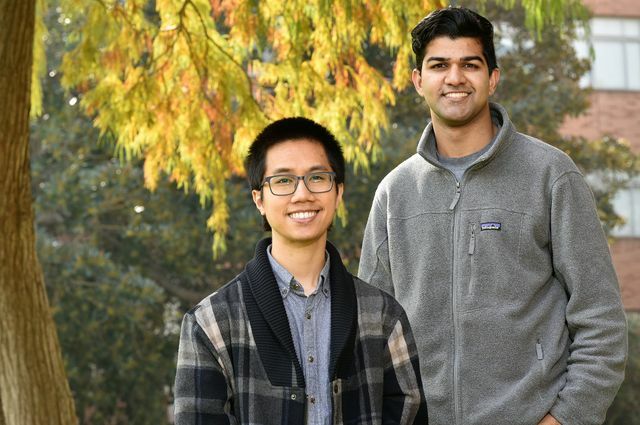 David Nguyen, left, and Nathan Mallipeddi are among the 10 to 15 juniors and seniors from California universities to receive Strauss Scholarhips. Whenever his teachers would give his class a writing assignment, the other kids would groan, but Nathan Mallipeddi was always secretly relieved. He much preferred writing over oral presentations because his stutter made it almost impossible for him to say the ideas in his head clearly in front of the class. 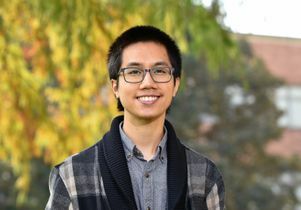 After he progressed through several community colleges and started attending UCLA three years ago as a transfer student, David Nguyen was disappointed to discover that when it came to his goal of applying to graduate school, he was far behind his peers. 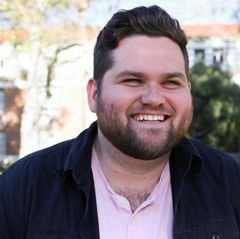 While those who had started at UCLA as freshmen had already begun conducting their own research and preparing strong graduate school applications, as a transfer student, he hadn’t had the opportunity, and he was already running out of time. But now, both Mallipeddi and Nguyen are turning the challenges they faced into inspiration to help others overcome similar obstacles. Mallipeddi, a third-year psychobiology and political science double major, and Nguyen, third-year sociology major, are each recipients of a $15,000 scholarship from the Donald A. Strauss Foundation that they’re using to help cover their educational costs and the public service projects they have each founded. The Strauss Foundation awards scholarships to between 10 and 15 juniors and seniors from 14 California universities each year, including all University of California campuses. Each university nominates up to three students to be considered for the award. 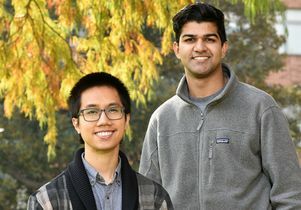 Mallipeddi and Nguyen are the first UCLA students to be awarded the scholarship in three years. Mallipeddi’s project, the Southern California Stuttering Service, provides resources and support for students who struggle with stuttering and other speech disabilities. Nguyen’s Community College to PhD Association is dedicated to providing research opportunities and mentorship to community college and transfer students who aspire to attend graduate school. Mallipeddi’s project was inspired by his challenges growing up with stuttering. He struggled to make friends and communicate, and because the special education teachers at his school were not trained in speech therapy, he had to work to overcome his stutter on his own. That’s why his Southern California Stuttering Service is geared toward K-12 students and provides funding for speech therapy and support groups for students with speech disabilities. “I really believe in this project and I want to affect the lives of as many students as I can, because I know how hard it was going through this,” Mallipeddi said. 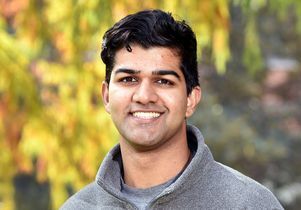 Most of the Strauss scholarship funds will pay for speech therapy for students who would not otherwise be able to afford or access it, Mallipeddi said. He’s worked with stuttering organizations across the country to identify families who need speech therapy support. So far, 10 students in Los Angeles, the Bay Area, Chicago and Seattle have already begun receiving therapy free of charge thanks to his organization. Mallipeddi also visited Granada Hills Charter High School in December to raise awareness and inspire acceptance of students with speech disabilities and other “hidden” disabilities. Mallipeddi encouraged students to reflect on how they, like many students who stutter, feel pressure to hide parts of themselves. Support group meetings bring together students across schools throughout Los Angeles so they can meet others with speech disabilities — an experience that Mallipeddi said can be life-changing. Workshops in January at Los Angeles high schools introduced them to adults (all of whom have speech disabilities) in a variety of fields who gave career advice and could serve as role models, showing students that they can succeed with a speech disability. There will be another workshop in March. Jennifer Wilson, former UCLA assistant vice provost for honors programs and a trustee of the Donald A. Strauss Foundation, is serving as Mallipeddi’s trustee mentor for the duration of his scholarship. The Strauss Foundation program also pairs scholarship winners with a mentor from the foundation’s board. Wilson said Mallipeddi’s project is efficient and feasible, and the selection board felt that an investment in him and his project would be an investment in a better future. “His personal experiences, the comments and support of his professors and mentors, his clear passion and dedication all show not only a fine student but also a man of emotional maturity who is already on the path to giving a voice to the voiceless,” Wilson said. And the Strauss scholarship is just the beginning. Mallipeddi said he has received an additional $15,000 from two Silicon Valley start-up companies to continue expanding the program. Nguyen also shares a personal connection with his public service project. As a transfer student who plans to attend graduate school, he noticed that while many community college and transfer students aspire to do research and apply to doctoral programs, they face extra challenges. “Community college alumni are underrepresented in graduate programs and research suggests they’re facing barriers,” Nguyen said. For example, he said, community college and transfer students tend to have fewer opportunities to conduct research, which is a crucial part of graduate school applications. Less research is done at community colleges, and once they transfer to a four-year university, they have less time left as undergraduates to do research and also to develop relationships with professors, who can be mentors and write recommendation letters. 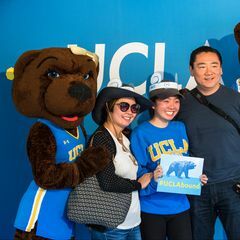 The Community College to PhD Association, which Nguyen founded as a club at UCLA last year, aims to give community college students and alumni the research experience and help with the application process necessary to become strong applicants for social science graduate programs. All students are given a research grant and other assignments to complete. They are required to apply for a summer undergraduate research program and develop a research proposal to apply for the Mellon Mayes Undergraduate Fellowship. Since being awarded the Strauss scholarship in May, Nguyen has selected 25 community college sophomores (all within 100 miles of UCLA) to form this year’s CC2PhD Scholars cohort, out of 71 applicants. Many are non-traditional students, identifying as former foster youth, formerly incarcerated, parents, and a student who completed a GED instead of a high school diploma. Each student has been paired with a UCLA graduate student mentor. Last quarter he held the first Saturday Academy workshop of the year, which covered topics such as research methods and applying to graduate school. The students will attend one Saturday session each month and then participate in a conference this spring so they can gain experience presenting their research projects. Nguyen’s Strauss Foundation mentor, Dr. Gordon Strauss, former UCLA associate professor of psychiatry and biobehavioral science, was impressed not only by Nguyen’s educational journey but also by Nguyen’s detailed proposal that reflected his persistence and dedication to education. “I felt it was one of the best proposals we have ever received, not only because his focus on community college transfer students is worthwhile, but because of the meticulous planning his proposal reflected,” said Strauss, who is one of the children of Donald A. Strass. David Nguyen, third-year transfer and sociology major. Nathan Mallipeddi, a third-year psychobiology and political science double major.